The Astor Crowne Plaza is located in downtown New Orleans, next to the French Quarter and Bourbon Street. NDPA’s host hotel for 2019 has a VERY unique location with lots of excitement, fabulous food, and entertainment. 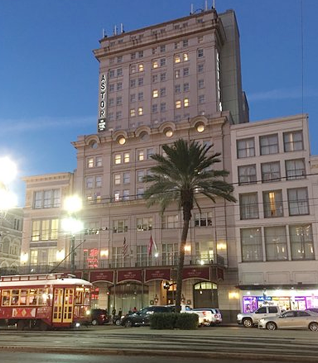 Where Canal Street meets Bourbon Street, the newly renovated Astor Crown Plaza New Orleans provides luxury accommodations amid the beating heart of the legendary French Quarter. Discover a rich diversity of elegant comforts and conveniences including free Wi-Fi, flat screen HDTVs, a sparkling outdoor seasonal swimming pool, an acclaimed on-site restaurant, and a state-of-the-art fitness facility. Just outside, you’ll enjoy a whirlwind of enchanting festivals, theater, music, cultural exhibits, and culinary delights. You’ll also enjoy close proximity to must-see attractions, such as French Quarter/Bourbon Street, Harrah’s Casino, Jackson Square, the Aquarium of the Americas, the Superdome, and Riverwalk Shopping. The NDPA Conference Rate is an amazing $155 per night. Our room block is limited so BOOK EARLY! Astor Crowne Plaza does not offer a hotel shuttle to the airport. The recommended mode of transportation is airport shuttle, taxi, or Uber/Lyft. Airport to Hotel transfer times can take approximately 30 - 35 minutes to travel. Super Shuttle rates from Airport range from $24 for a shared ride and are higher than that for a Non-Stop ride. Taxi rates from MSY start at $40 - $42 one-way.